The Harwood Arms would be unassuming anywhere in London, in a quiet Fulham sidestreet I managed to walk past even though we had made a special visit. Inside it is slightly more chic rustica with well trodden wooden floors and farmhouse furniture. 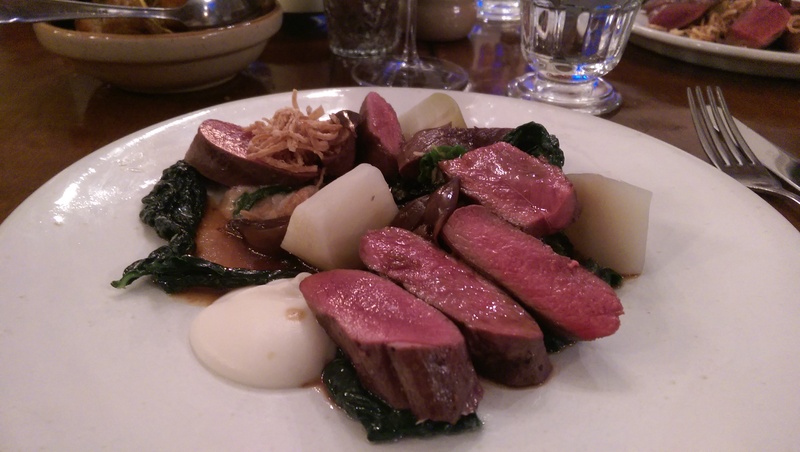 The menu benefits the surroundings with The Harwood Arms promoting itself as purveyor offal, game and country produce. The prices could equally be at home outside of London, 3 courses for £39.50 representing good value for a 1* establishment. 5/6 options for each course give you some difficult decisions. Hereford snails with stout jumped out at me by way of a starter. 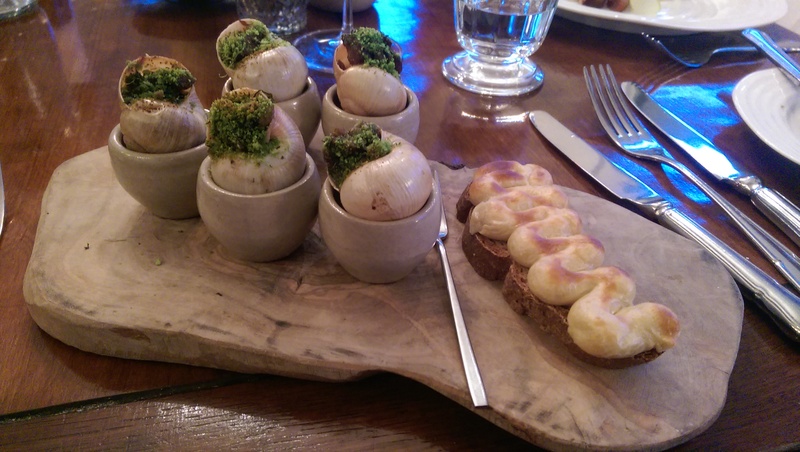 It arrived more daintily presented than I expected with 5 plump snails served in their shells. A decent flavour in the liquor complimented the molluscs who were on the chewier side than ideal. Despite the aforementioned value I felt shortchanged with this course, especially with my friend tucking into a chunk of homecured smoked salmon. I couldn’t say the same for the main course, as my perfectly pink deer was copious in anyone’s eyes. Celeriac, white beetroot and cabbage gave the dish an earthy woodland feel, smoky bone marrow bringing that extra, decadent, dimension. 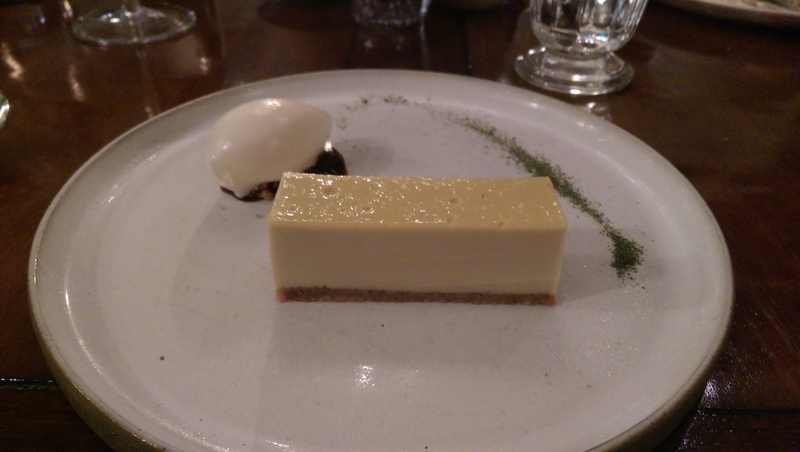 Dessert was most intriguing and most probably my favourite dish of the evening. Blackcurrant leaf tart is quite an adult pudding, the flavour of the leaf much more subtle than the currants themselves. There’s a fragrance and freshness to it and whilst the vivid purple isn’t present the flavour is muted but familiar. Something unique is hard to come by these days. A slight disappointment with my starter aside, the Harwood Arms provided an very enjoyable evening. It’s the sort of place you could convince yourself is reasonable enough to go every couple of weeks, in reality probably not. The skill in the kitchen is evident and the ingredients, seasonality and Britishness combine to deliver a solid 1* meal.